Are you writing down your goals? Zig Ziglar, Brian Tracy, and many other successful people emphasize the importance of writing down your goals in order to achieve them. Our oldest daughter Heather lost a lot of weight last year by taking and teaching zumba classes, beginning to walk and run, and eliminating white sugar and junk food from her diet. She ran her first 5K last year. I was there at the 5K to cheer Heather onto the finish line. After seeing her, and my friends Cindy Rushton and Susan Evans run their 5K’s, I was determined that I was going to do a 5K this year, too. 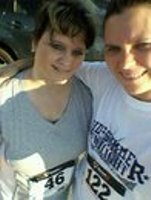 When Heather found out about the 5K walk/run in Lee’s Summit, she signed up to run it and challenged me to do it, walking. I’d already written down the goal for this year, and knew this was not something to put off, ready or not. I haven’t been walking consistently the last few months. I was concerned I’d have to stop half-way through, that I’d be the only one walking it, or that I’d come in last. To my surprise, I finished it and even beat the timing that I thought it’d take me to do it – and I didn’t come in last! Heather has been taking a kickboxing class the last four weeks and tonight is her last class. This is a huge sense of accomplishment for her after struggling with her weight after having two kids. Heather was diagnosed with strep throat a few days ago, so all she wanted to do was finish the 5K (running) without stopping. To her delight, she was able to run the entire 5K, completed it in only 1 minute less than her last 5K (even having strep throat! ), and she earned a medal for her timing for her age group! Way to go, Heather! I’m so proud of her! Now RUNNING a 5K one day is on my bucket list. (Ok, it’s out there! Keep me accountable!) Of course, I have a lot of work to do to prepare and to train for it. My first goal is consistent walking. This 5K showed me a couple of things that I want to encourage you with. Spend some time with God and write down your goals. What does He want you to do? There is something about the physical act of writing them down that makes them more concrete and motivates you. Writing them down keeps them on your mind and in front of you all the time. Write down both big goals and small goals. Write down yearly goals, monthly goals, weekly goals, daily goals. I use several tools to help me with goal-setting and to-do lists: a Franklin Covey Dayplanner (my brain in a binder as Cindy says), sticky notes, a Dry Erase board in our kitchen, a Google calendar, and my cell phone. I may not write all my goals on all of these, but I use each of them regularly. Write down specific goals.Write down the details of your goals with a deadline. If you write, “I want to have a successful business one day,” you may never accomplish your goals. If you write, “I want to earn at least $2,000 a month with my at-home business,” then you have far more chance of achieving your goal. It’s concrete, it’s something specific to aim for now. Break down your goals into smaller chunks. How will you reach that goal? List the steps to get there, such as setting up a WordPress website/blog, creating an opt-in form on your site with a compelling offer for people to sign up on your mailing list, beginning to write and do article-marketing, creating great content for your readers and listeners, becoming active and connect with your niche on social media, creating products that your specific niche needs and wants, continually learning through education and training, having knowledgeable and successful coaches and mentors who are pouring into you, etc. Think positive, faith-filled thoughts. I am so thankful to God that He gave me the scripture Isaiah 40:31 for me and Heather the week before the 5K. It really encouraged me and I reflected on it before the 5K started. God’s word is truth and is eternal. If you struggle with doubt and unbelief or negative thinking, renew and reprogram your mind with the Word of God. It’s faith that pleases God. Although I was concerned I wouldn’t be able to finish the 5K, I did tell myself, “I can do all things through Christ who strengthens me” before the walk (Philippians 4:13) and remembered Isaiah 40:31. If I had told myself repeatedly, “I’m never going to finish,” I probably woudn’t have! Thinking positive, faith-filled thoughts will help you to overcome any obstacles and to accomplish your goals. Then at the last stretch of the 3rd mile, Heather joined me and challenged me to jog to the finish line. She jogged alongside me, cheering me on. Some of the runners finished the 5K in 18 minutes. I couldn’t compare myself to those runners, not even to Heather and her timing. I had to focus on my goal – to complete the 5K. I even beat the timing that I thought I would complete it in, so I was happy about that. Yes, I am sore today and I even have a callous on the bottom of my foot (I earned it!) But I did it! Keep setting new goals, becoming all that God wants you to be. God created you for a specific purpose for His glory. You can do it! If you’d like to learn more about fulfilling your purpose, click here.